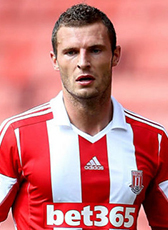 Erik Pieters was developed at the youth academy of FC Utrecht. In 2008 he was signed by PSV for a 2,5ME fee after making impression on Eredivisie level. After five seasons in Eindhoven, winning the Dutch cup and two Supercups, he signed for English Premier League club Stoke City on 28 June 2013 on a four-year contract for a fee of 3,6ME. Pieters became a solid defender for the Potters and extended his contract at the end of 2015 with another 3 year until 2020. In January 2019 he moved to France for a loan period at Amiens. Pieters played for several youth selections of the Netherlands and made his debut on A-level in 11 August 2010.